Having had a lot of fun with my digital collage and brushwork, I picked up the dip pen and filled my inkwell once more to explore Option One. Dip pen and ink with real wash.
Having fuddled around with birds for some weeks, I felt warmed up. My drawing hand was in action again. I was feeling a bit racy. The big brushy birds were fairly cumbersome in terms of getting the dance action going, and I wanted to see how these birds might actually look dancing; particularly in pairs or groups. So here’s where my trusty dip pen came in. I used the same one for the whole of Thunderstorm Dancing and I’m not sure what I’ll do when this particular ratty nib gives up the ghost. It’s pointy and twitchy and zippy and once the pen hand is warmed up, the quicker the drawing, the better. In my first sketches, I referred to pictures of people dancing. The birds looked rather hilariously like people in bird costumes. Here you see me trying to figure out how to turn a human dance pose into the equivalent bird pose. Doesn’t work. The bird’s leg joints are so different that when forced into a corresponding pose, they become stiff and awkward. They were terrible. After that I put Fred and Ginger aside. Phooey! Better to just look at birds and make their gestures approximately dancelike. Despite my lack of dance expertise, I could put more of an expressive spin on a bird drawing without scrutinising a real dance move. Then it became more fun. These birds were attending an imaginary ball. I gave them names. Just because. Spotted at the ball this evening – Miss Ophelia Oriole in yellow cape and tiara. Sparking rumours this evening at the ball, Adele Coiffe and Thomas Furle were inseparable on the dance floor. A Mysterious Mallard wowed the guests at this evening’s festivities, but departed hurriedly at midnight, leaving behind a puddle of water. Lastly, I spend about 40 minutes whipping up a page spread in this style to see how I’d go with drawing a crowd. It wasn’t so great, but it was good enough to act as a sample for discussions with the editorial team at Harper Collins. I’ll be interested to hear what treatment you would have chosen. But I have to say voting has closed and the team at Harper Collins voted unanimously for…. Was it the shoes? Too much? 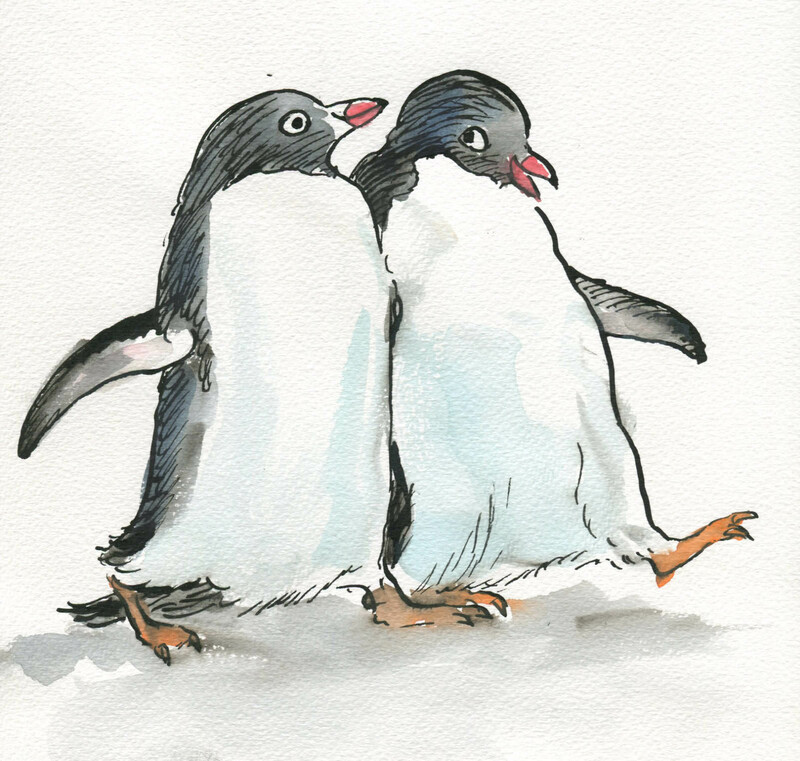 This entry was posted in art projects, birds, books and reading, creative process, Leonard Doesn't Dance, Uncategorized and tagged Australian illustrator, birds, character development, children's books, drawing, illustration, indian ink, ink, picture books, watercolour on February 19, 2016 by Judy Watson. Over the summer school holidays, I had the pleasure of pulling out all the monotype equipment, unused for many months, and taking it for an outing to the back garden of the new house. There is a space under the decking that’s perfect for fine weather art activities. The boys and I set up two trestle tables there and had a lovely afternoon of printing in the warm air. While the boys printed an assortment of monsters, animals and fancy lettering (most of which they remembered to reverse as they drew), I printed chickens, dogs and portraits of them drawing. They were mostly autonomous because they had printed before and are old enough to manage on their own, but my focus was divided between my own drawings and theirs, so I came back a few days later and had another go on my own. Author Ann Martin had kindly posted me her collection of cabinet card photos after my last post on vintage clothing (here) and I decided to use these as the basis for my monotypes. I had also been admiring one of my favourite books Detour Art. I LOVE that book, (one of my favourite Christmas presents ever!) and browsing through it again led me to look up and explore further the work of Thornton Dial Sr. who died only last month. You can see the video A Day With Thornton Dial Sr. here. Thornton Dial’s work ranges between sculpture using found objects through to several dynamic painting styles. 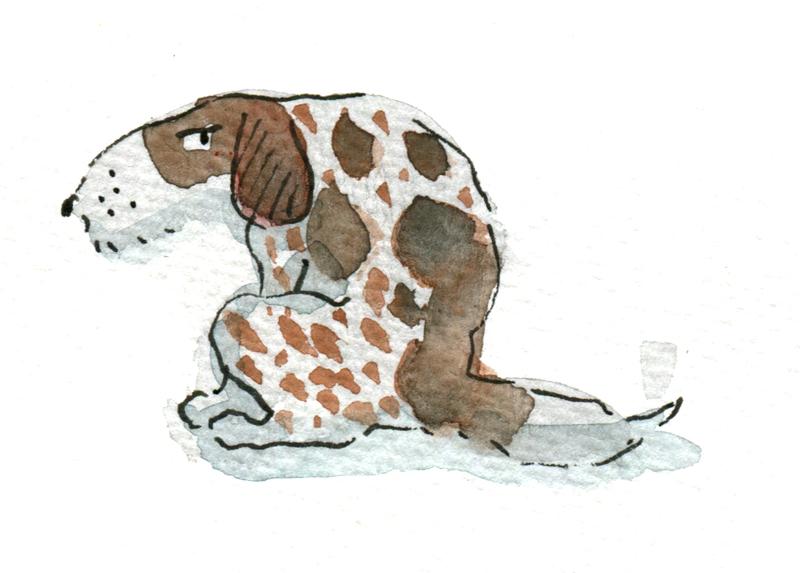 One of his loose drawing styles made me itch to print some monotypes and add either dry pastel or watercolour to them. I love the way his rapid line work dances with the limited colours he adds. Below are some of Thornton Dial’s works that make my heart race! As you will see, my own work is nothing like his whatsoever. As with most artistic adventures, the artwork takes on a life of its own, and mine were no exception. They were mostly drawn using a continuous single line, using a heavy crayon pressed firmly on the back of the paper. I was seeking a heavy line with bleed but also a loose line, and was mostly successful in this. Bearded man – first take. The original did not look as heavy as this darkened photo and I increased the pressure when drawing the subsequent images. Bearded man – second take. (These were drawn from the same photo, so you can see that I was not attempting to achieve a likeness.) This is the image that I was most pleased with. I have an irresistible urge to add an off yellow background and pink to his tie, so he may yet be ruined, but I have taken the precaution this morning of gluing him to a cardboard backing in order to prevent buckling when I take paint to him. After completing a few other prints, including the frilly little lass at the top of the post, I brought the prints indoors to dry so that I could add colour. I started with the first bearded man, because the outline was too weak to stand alone and I thought that by adding colour I’d either ruin it (and not mind) or redeem it. The paper buckled a little but not too much as it is a heavy weight paper. I solidified some of the outlines and I had an absolute ball throwing the colour on. But I’m not overly excited about him. And I didn’t leave enough white space for him to breathe. He may have been better on a white background. I then added colour to clown-like ‘Jude Law’. By golly it was fun to slosh the paint on a large piece of paper! I stopped after that. The girl would not benefit from colour and the other bearded man, being my favourite, deserved some thought and a backing board before proceeding, if at all. I’ve now done the backing board, and I must decide his fate! This entry was posted in art projects, creative process, family, Uncategorized and tagged Cabinet cards, drawing, family activity, ink, kids' activities, monoprint, monotype, portrait, printmaking, watercolour on February 6, 2016 by Judy Watson. I went away with some good friends in the September holidays for a long weekend, and began a range of art and craft projects which I promised to post here. I’ve been too busy until now to look at them further but now it’s Christmas holiday time, and I had a great time the other day, getting things out to play with in the studio! Hooray! As part of my continuing fascination with vintage cabinet card portraits, I had drawn at some children from old photos and added shadowy blob shapes of old world beasts and imaginary creatures into their formal poses. I hadn’t by any means fully thought out the ideas I was exploring, and I still haven’t. 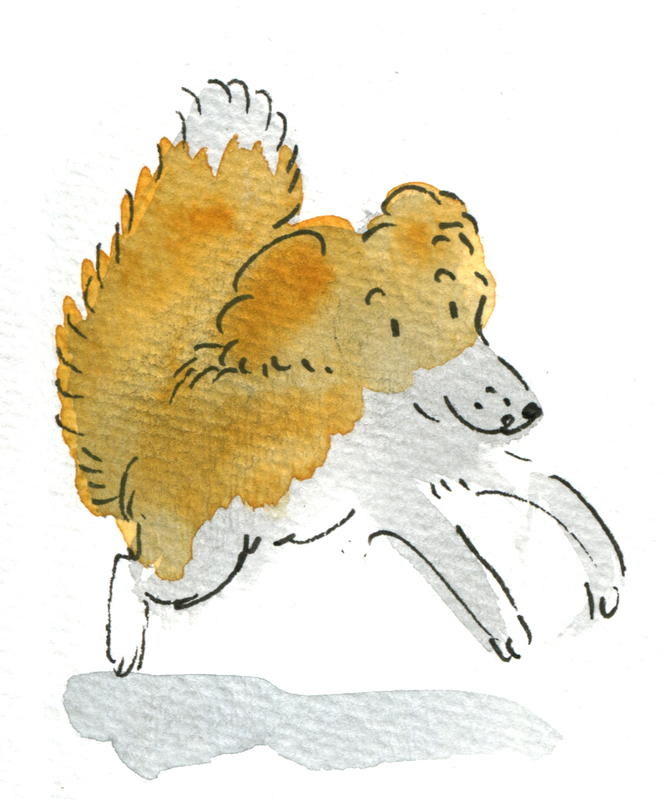 But I added some watercolour detail with a fine brush the other day and scanned them. So here they are. I will probably do some more with this, and see where it goes. I think monsters take time to form properly. These are only partly menacing, and it’s unclear whether the children are aware of them or not. They may be allies, or the monsters may even be generated by the children themselves. 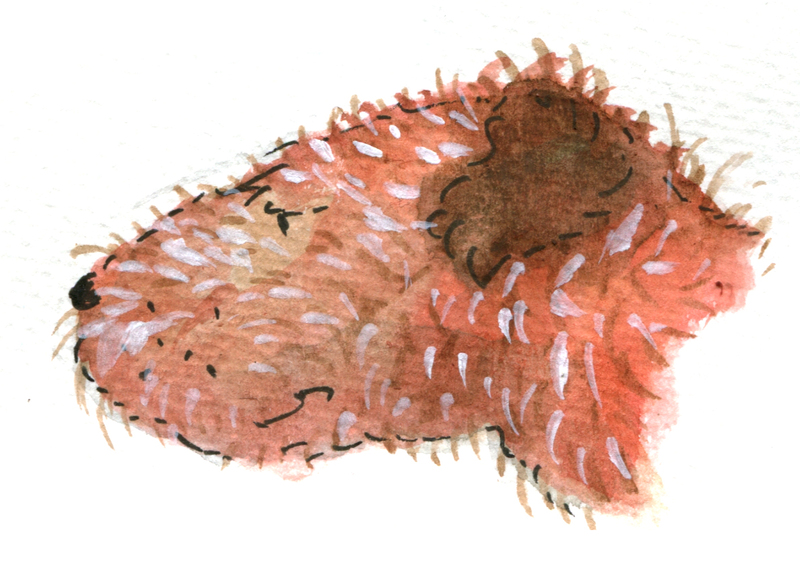 This entry was posted in art projects, Uncategorized and tagged beasts, blobs, cabinet card portrait, children's portrait, dog, familiars, indian ink, ink, monsters, vintage, watercolour on December 29, 2015 by Judy Watson. 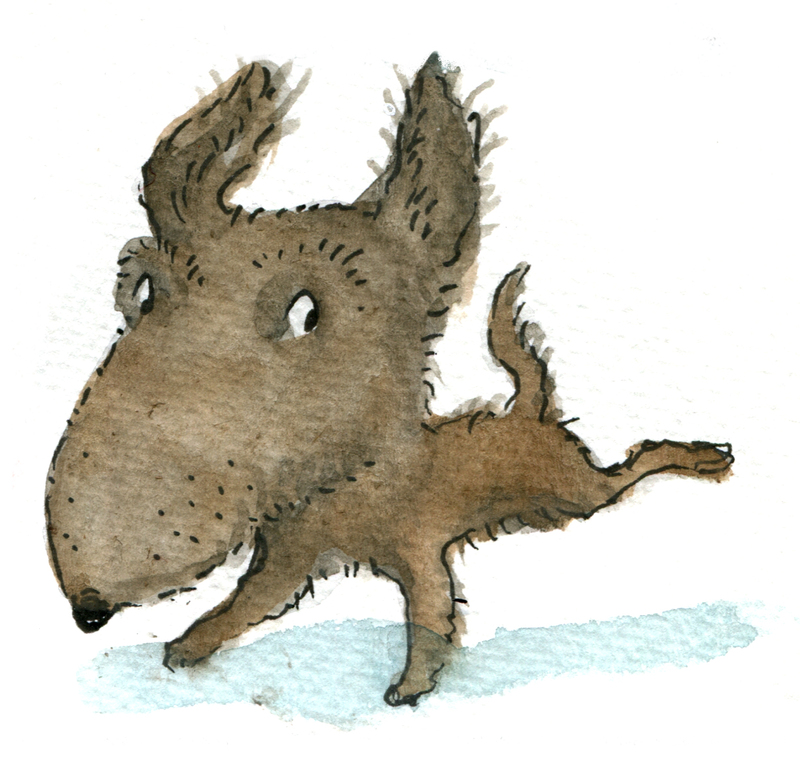 As some will know, my current book project is a picture book by Frances Watts to be published next year by HarperCollins. Leonard Doesn’t Dance is the title, and it will feature a cast of feathered friends of many species. 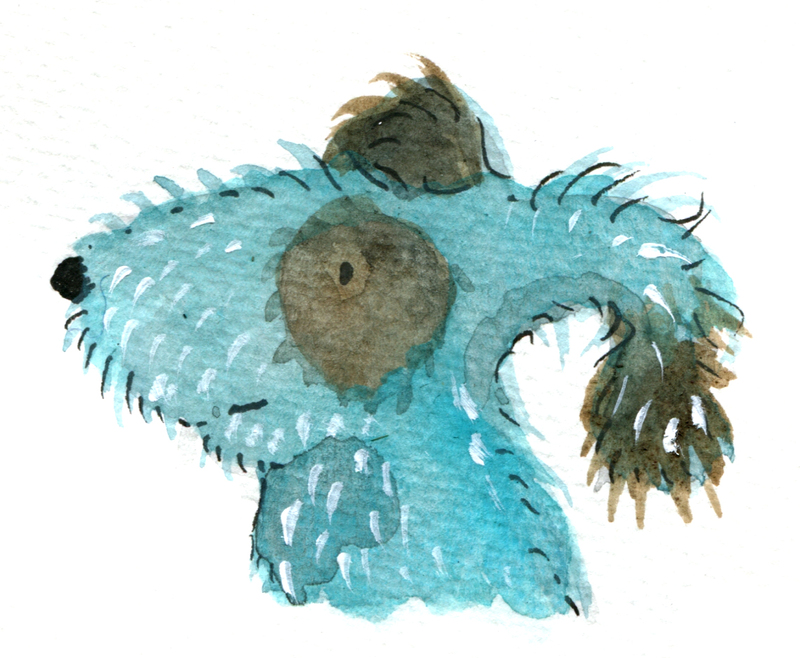 Leonard and his friends have been forming on the page but I’ve yet to definitely decide on the medium that will best suit the book. As a way of exploring options, I’ve begun getting to know this list of species. 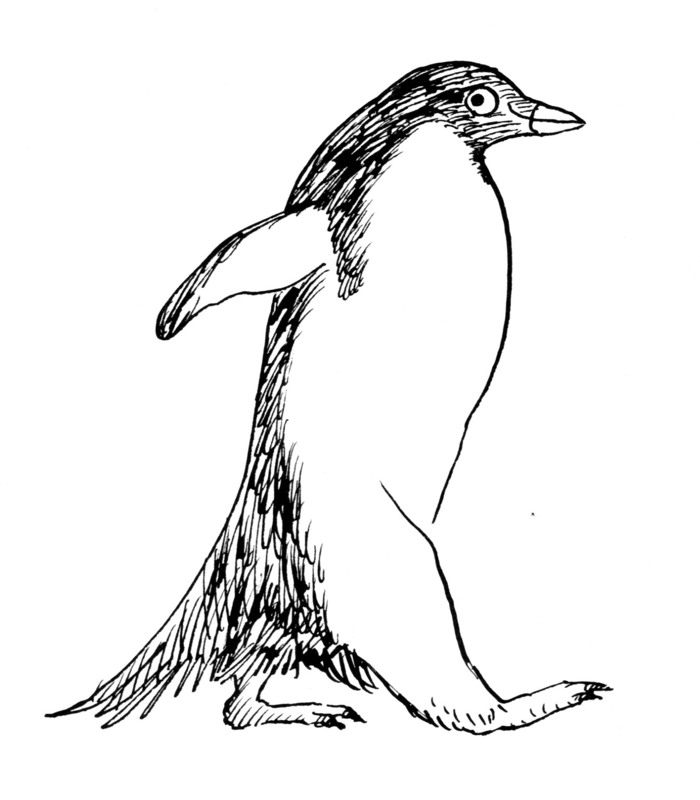 A warm-up penguin. 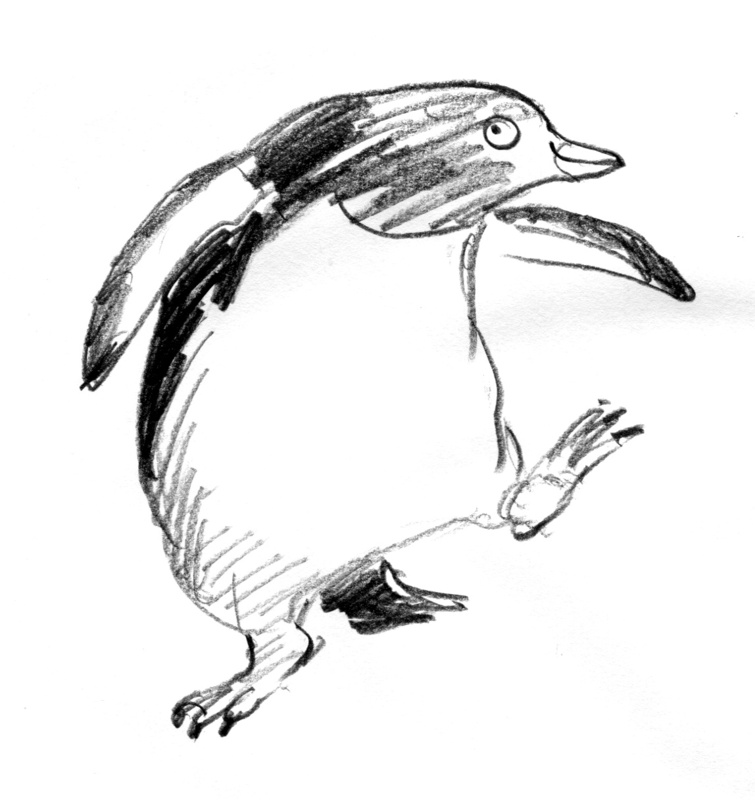 I liked to think I was channelling William Kentridge with my deft use of the eraser… but really, this is just a warm-up penguin. My eraser was employed in deftless ways. 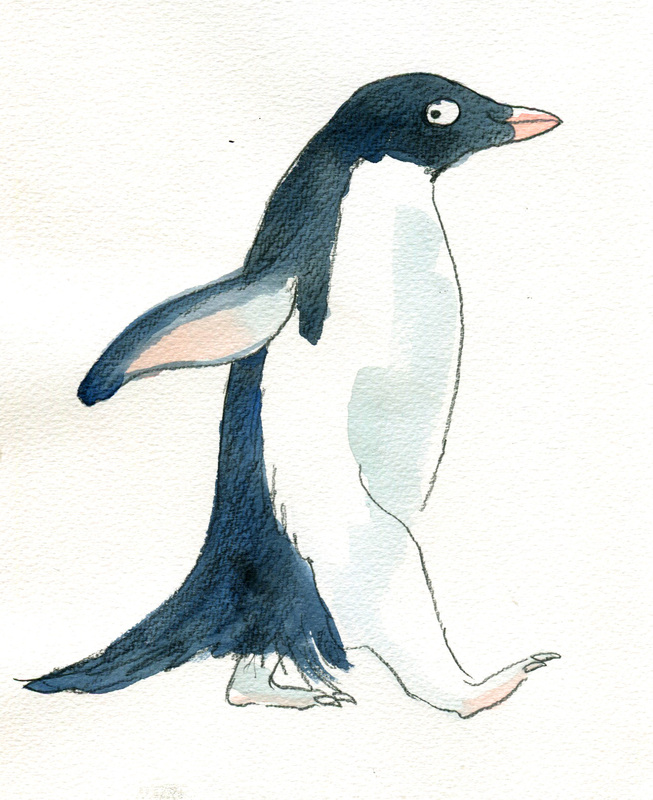 A half-warmed up penguin, using a soft pencil and watercolour. I need to bond with penguin feet. They are thick and sturdy and look like lumps of pink putty. These are not right. But I like the head. A tighter line. Testing the look of a more stylised shape. This penguin is quite athletic. I didn’t realise that some penguins have rather long legs. Even if much of the leg appears to be inside their body. Rather like walking around inside a large pillowcase with your toes in the corners… Or not. 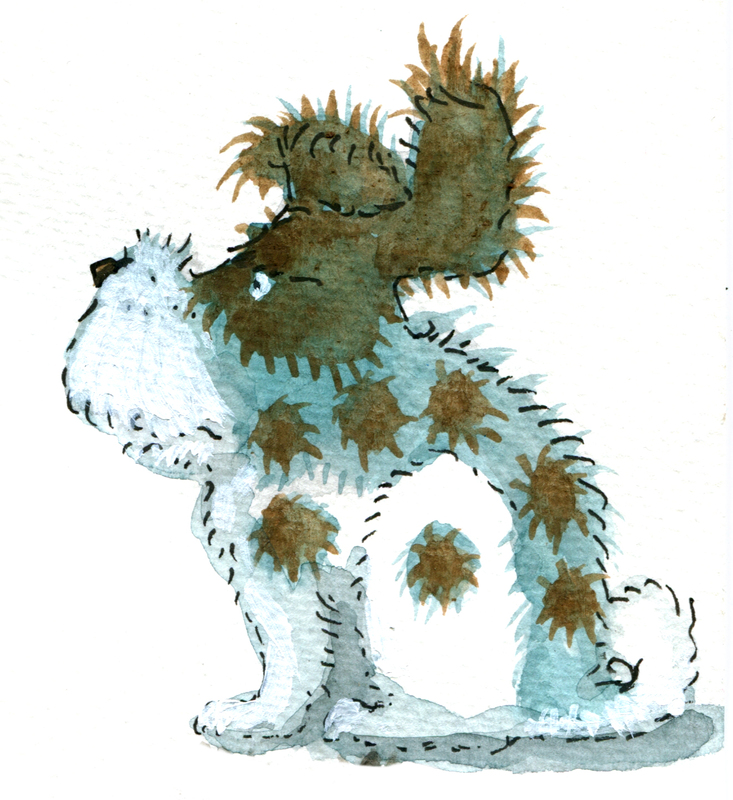 I do like the watercolour over the textured pencil. A tighter outline again with an exaggerated shape. But still with a loose hatching technique. I don’t do tidy hatching. I associate it with things like ironing shirts. A useful skill that I don’t have the patience for. Looser? Almost the same head. But loose and with added dance steps. Looser with ink. I think this is a combination of the last two. Or three. A question arising is the ink. This ink is water soluble. 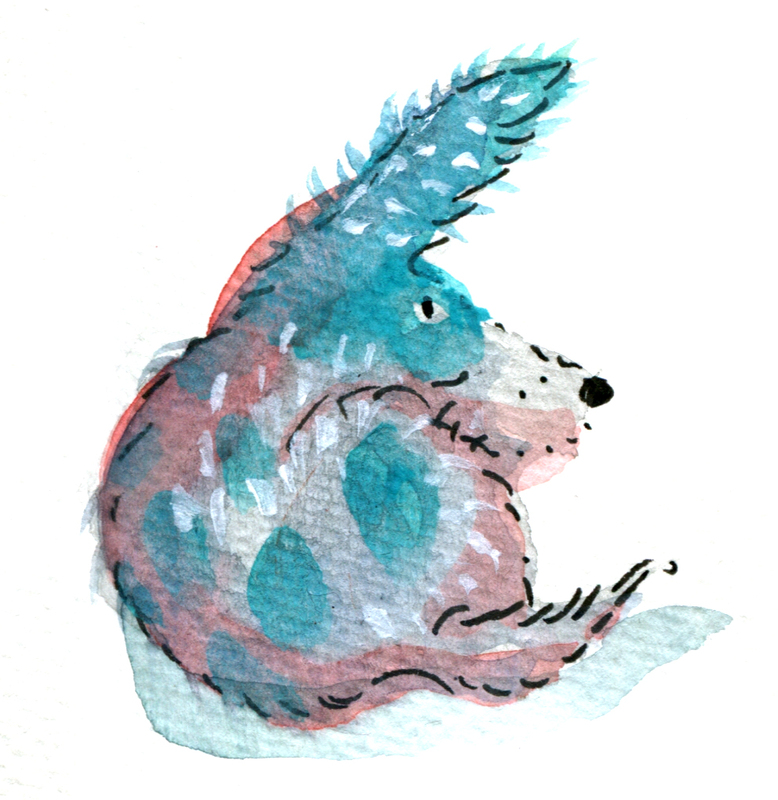 I often enjoy this, because it’s rather scrumptious to see the line dissolve under the watercolour brush to do unexpected things. I mostly like unexpected things. But would I like unexpected things to happen on my final artwork? Maybe not. Also, it’s hard to lay clean colour over dissolving black ink. I will want some of my colours to be clean. I will have a try with water-fast ink later. But there are other ways around this. I could do the black part with water soluble ink and print out the illustrations onto fresh watercolour paper before adding colour. But all this can get rather complicated and size can become a limitation. There is much to ponder over the next few weeks. I will share some finches with you soon. This entry was posted in art projects, birds, books and reading, creative process, Leonard Doesn't Dance, Uncategorized and tagged birds, character development, children's books, illustration, improvisation, indian ink, ink, watercolour on December 9, 2015 by Judy Watson. I’m working flat out to finish Thunderstorm Dancing before the end of the month, so I haven’t much time to post here. 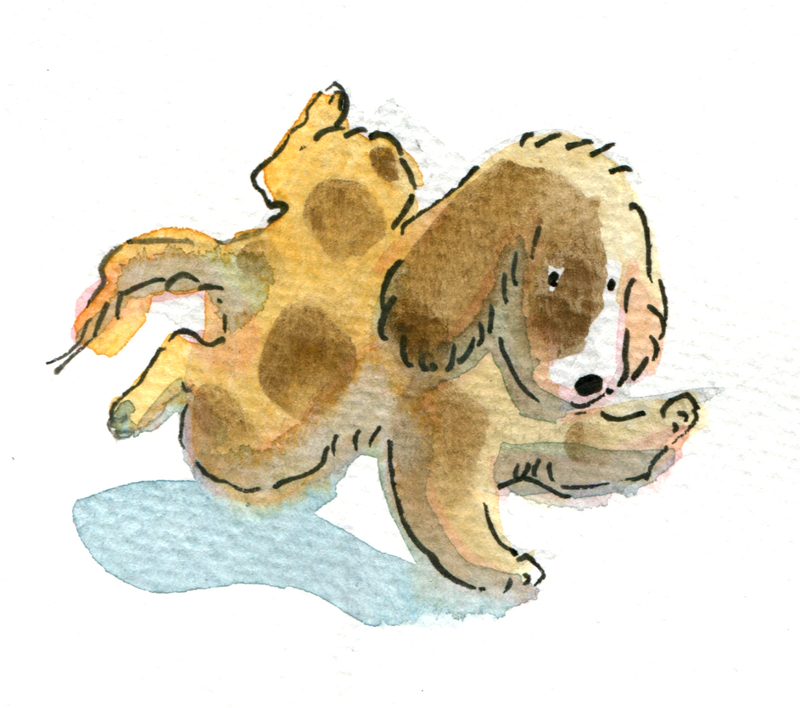 Nor is there much to post, because the illos for the book are under wraps until publication… apart from small snippets. Yesterday I finished the endpapers for the back of the book. Today I’ll hopefully finish the front endpapers. I suppose it could be okay to post a bit of an endpaper on Endpapers. Here’s part of the back endpapers. This didn’t really work, because I was hurrying so much. Having said that, the imperfect, rough edges on everything are deliberate. 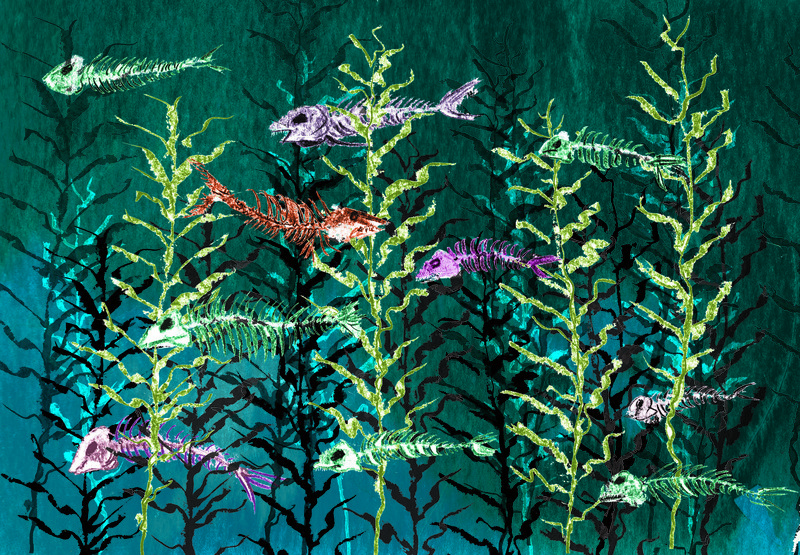 I like the rough prickliness of the pasted fish and seaweed drawings, which gives them a fossilised or desiccated look. Both of these works are made using drawings done with Prismacolour Artstick, scanned and coloured in PhotoShop, on top of watercolour and ink background washes. 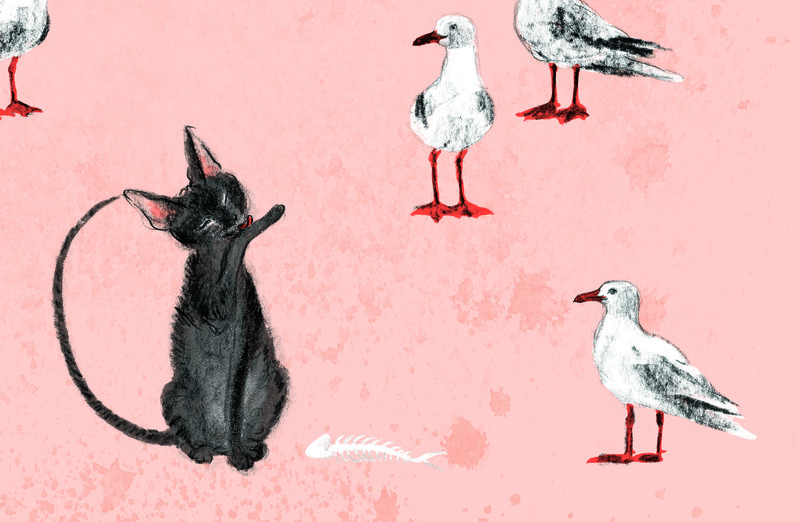 Oh, and lastly, just this little fragment from one of my illustrations for the book. (The lightning page.) 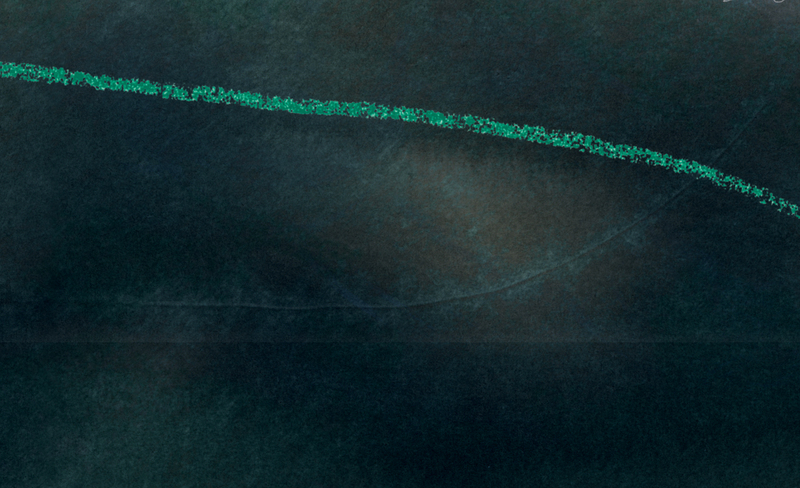 I love the close-up sections of some pages, with none of the action or figures present, making them abstract. This one reminds me of the skin of a whale swimming deep underwater. I feel I should paint a whale eye and put it in one corner. Perhaps later, when all is done. This entry was posted in 52 Week Illustration Challenge, birds, books and reading, cats, creative process, Uncategorized and tagged #illo52weeks, #thunderstormdancing, 52 week illustration challenge, bones, Cornish Rex, digital art, endpapers, fish, Halloween, ink, Prismacolour, seaweed, thunder, underwater, watercolour on October 17, 2014 by Judy Watson.